Virginia Tech researchers used a gene disruption technique to change the eye color of a mosquito, a critical step toward new strategies for disrupting the transmission of diseases such as dengue fever. The eye colors of these mosquitoes are varied because of cell-to-cell variability in the degree of gene editing. Scientists at Virginia Tech have disrupted the genes that control eye color in mosquitoes, using a genetic-engineering technique that could also disrupt the transmission of diseases such as dengue fever. The technique relies on two specially designed proteins that belong to a class known as transcription activator-like effector nucleases, or TALENs. The technique can target DNA at a specific site in an organism's genetic code, so precisely and efficiently that the journal Science has called the molecules "genomic cruise missiles." Virginia Tech entomologist Zach Adelman prefers a different analogy. "They're basically a very, very fine-tuned pair of scissors," he told NBC News. 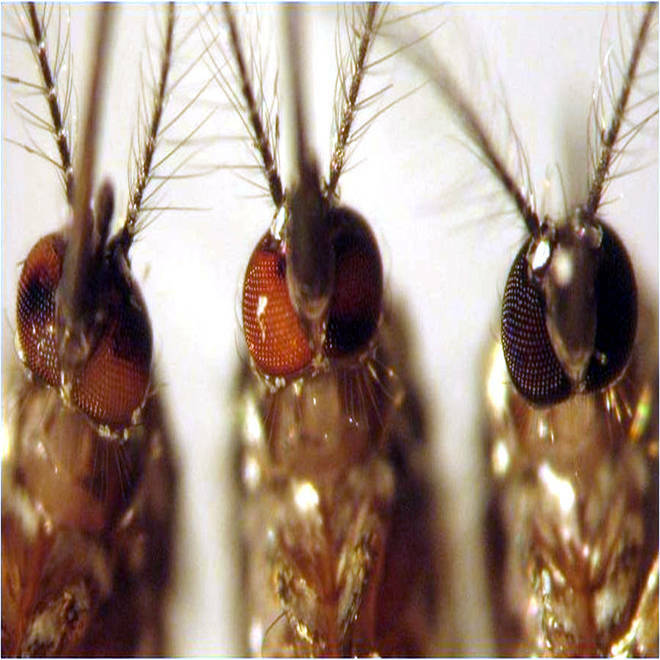 TALENs have been used to edit the genomes of animal and human cell cultures, but Adelman said the approach he and his colleagues used on the mosquito genome was different. Rather than trying to modify the function of a gene, the researchers aimed to disable a gene by snipping away at it. In the journal PLOS ONE, they describe how they targeted a gene whose protein product is essential for the production of eye pigment in Aedes aegypti, the mosquito species linked to the transmission of dengue fever. Genetically engineered TALEN proteins were injected into the germ cells of mosquito embryos early in their development, with the intention of disrupting the coding for eye pigmentation that would be passed down to the next generation. When the targeted mosquitoes gave birth to baby bugs, a large percentage of them had light-colored eyes instead of the typical black eyes. The lack of pigment served as confirmation that the genetic code was wiped out. The next step is to identify the genetic mechanisms in mosquitoes that play a role in virus transmission. When the right targets are found, the researchers will try to design a different set of molecular scissors to disrupt that genetic code. Adelman said he's been working on molecular strategies to fight mosquito-borne diseases for a dozen years, and began the TALEN-based project just last May. "To date, efforts to control dengue transmission through genetics have focused entirely on adding material to the mosquito genome. Ensuring that this added material is expressed properly and consistently has been a challenge," Adelman said in a Virginia Tech news release. "This technology allows us to pursue the same goals, namely, the generation of pathogen-resistant mosquitoes, through subtraction — for example, removing or altering a gene that is critical for pathogen replication." In addition to Adelman, the authors of the PLOS ONE paper, "TALEN-Based Gene Disruption in the Dengue Vector Aedes aegypti," include Azadeh Aryan, Michelle A.E. Anderson and Kevin M. Myles. The work was funded by the National Institutes of Health and the Fralin Life Science Institute at Virginia Tech.